Keeping up with its heritage of transporting people and goods with peace of mind, Ebrahim K. Kanoo, the sole distributor of Toyota vehicles in Bahrain, has revealed a new-generation Hiace van and minibus range with advanced safety features, powerful new engines, increased ride comfort, and a host of new specifications. 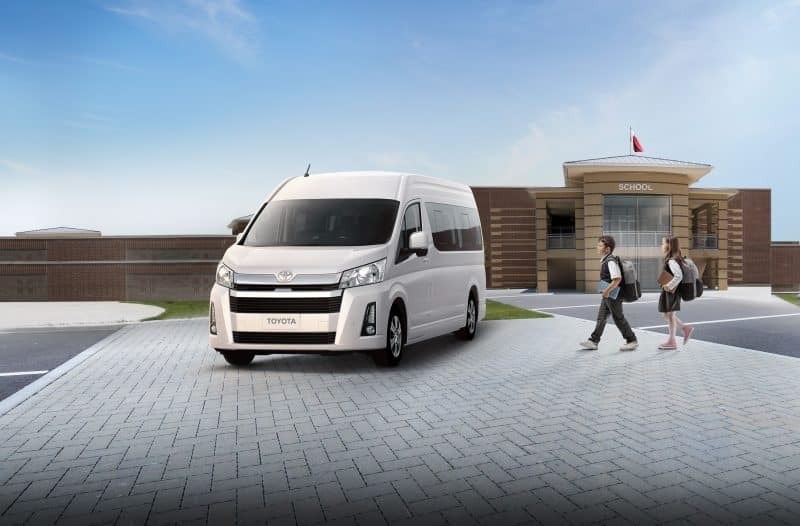 Featuring a semi-bonnet design that enhances reliability, toughness, and functional beauty, and offering a wider choice of body sizes and wheelbase lengths, the all-new Hiace is set to be the highlight of Bahrain’s light commercial vehicle (LCV) market. “The Hiace was developed using the keywords ‘Hiace Pride’ as its foundation, and in line with the concept of being a faithful partner that makes people feel safe, satisfied, and proud. Owners, drivers, and passengers know they are in good hands when they own, drive, and ride in a Hiace,” commented Chief Engineer Takuo Ishikawa, who was at the helm of the all-new vehicle’s development. Since the launch of the first-generation Hiace in 1967, it has become one of Toyota’s representative global vehicles, with more than 6.24 million units sold in over 150 countries. The Hiace demonstrates prowess through its high durability and reliability, and has been used as a van, minibus, and as private transportation. Currently, it is largely sold in Asia, the Middle East, Africa, Oceania, Mexico, and Latin America. The shift to a semi-bonneted design has enabled the development team at Toyota to implement significant changes, which include a stiffer frame, stronger straight-line performance, greater stability and manoeuvrability, and more flexible suspension. Complementing the all-new vehicle’s enhanced reliability, toughness, and functional beauty is a dynamic driving experience powered by two new engines – a 2.8-litre four-cylinder diesel engine and a 3.5-litre V6 naturally-aspirated petrol engine, with both being offered with a six-speed manual or automatic transmission. Aiming to enrich the customer’s experience, the all-new Hiace has been revamped inside-out with the objective of addressing two goals. The first is to create a vehicle that increases productivity, and the second is to provide safe, comfortable, and reliable transport for people everywhere. The all-new vehicle’s spacious cabin space is built for maximized storage, with added features elevating the ownership experience to an unprecedented degree. The sixth-generation Hiace has also adopted a number of improvements for easier ingress and egress. There is noticeably bigger legroom, providing an enhanced riding experience enabled by wider doorsteps, strategically-positioned assist grips, and illuminated entry system. Living up to the Toyota tradition of always making safety a top priority, the sixth-generation Hiace gives its customers peace of mind by reinforcing both passive and active safety. Engineered to relieve the commuting burden from its drivers and passengers, the all-new vehicle’s design cues are inspired by real-world problems to provide modern solutions. In addition to high-level body rigidity achieved through ring-shaped frame structures, the vehicle is characterized by an impact-absorbing body structure that leverages a straight side member to effectively absorb impact energy. The comprehensive array of safety features in the vehicle also include driver and front passenger SRS airbags, and a passenger airbag with a mini-clamshell design to protect centre seat passenger.